The 2019 World Junior Championship will take place in Vancouver and Victoria, Canada, from Dec. 26 to Jan. 5. As camp rosters are finalized, several Buffalo Sabres prospects will likely see action for their native country. 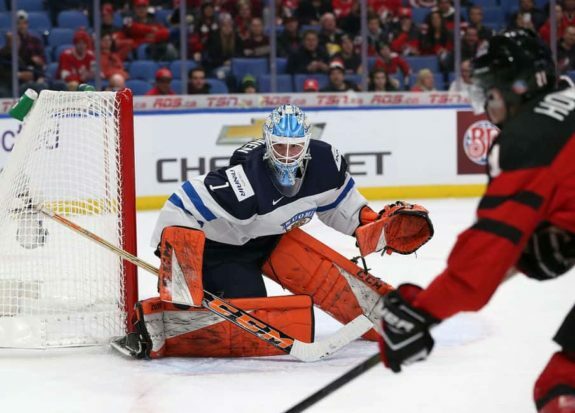 Goalie Ukko-Pekka Luukkonen (Finland), defenseman Oskari Laaksonen (Finland), defenseman Mattias Samuelsson (United States) and center Matej Pekar (Czech Republic) are set to play in the tournament in British Columbia. Competing in the tournament this year are teams from Canada, Finland, Russia, United States, Czech Republic, Sweden, Denmark, Slovakia, Switzerland and Kazakhstan. This is an introduction to the Sabres prospects competing at World Juniors. Luukkonen’s transition to North America has been smooth and seamless. He’s played well for the Sudbury Wolves in the OHL this season, compiling a 19-5-1-1 record and is a big reason they sit in third place in the Eastern Conference. He has a 2.50 goals against average and .923 save percentage, both in the top-five among OHL netminders. The big goalie’s size and athleticism are building blocks as he continues to refine his game with better reads and playmaking decisions. With prior experience, he’s expected to be Finland’s No. 1 starter. Depth-wise for the Blue and Gold, Luukkonen ranks behind former third-round draft pick Jonas Johansson who is currently with the Cincinnati Cyclones and Linus Ullmark who is playing for the Sabres. Luukkonen is the team’s youngest goalie under contract. Finland opens the tournament Wednesday with a 10:30 p.m. preliminary-round game against Sweden. Laaksonen is a prospect on the rise, developing and gaining confidence with every game for Ilves during his first Liiga season. He plays top-pair blueliner minutes, averages 20:46 of ice time and has 13 points (three goals and 10 assists) and a plus-five rating. He’s one of Finland’s best defensemen and plays on both the power play and penalty kill. His skating is fluid, his skills are top notch and his vision of the ice is excellent. If he continues on his trajectory, he’ll likely wear the Sabres’ blue and gold in a few years. Laaksonen signed a two-year extension with Ilves, but is able to leave early to join the Sabres when, and if, he signs a contract with the team. Samuelsson’s game is developing nicely during his freshman season at Western Michigan University in the NCAA. Though he’s not getting much special team play, he’s still chipping in some offense (three goals and three assists) in 14 games for the Broncos. The oversized blueliner uses his body well and has a simple, yet effective way to his game. He moves fluidly, his passes are crisp and he positions himself well. Samuelsson, 18 years old, is coached by Andy Murray, a veteran NHL coach who served as head coach of the Los Angeles Kings and the St. Louis Blues. The demanding Murray knows what it takes to achieve success in the NHL and asks a lot from his players. Pekar, 18 year old, has 12 goals and 21 assists for 33 points in 30 games with the Barrie Colts of the OHL. Nine of his first 10 goals came during his first 15 games, so the youngster has struggled of late. Though his production has trailed off, his worth ethic and energy are constants. The tenacious forechecker gives everything he has on every shift. Pekar signed his entry-level contract with the Sabres in October after making his presence known at development camp. This will be his first time playing in the World Juniors. The Sabres will have their scouting staff at the WJC as it features plenty of rising talent that will be eligible in the upcoming NHL Entry Draft. The team currently holds three first round picks. Even with an extended playoff run, Laaksonen, Luukkonen, Samuelsson and Pekar will not play for the Sabres this season. However, it’s likely they could become important players for the organization in the coming years.